Tatara is bit unusual. First, it’s a “big box” game from Japan that’s not war, anime or D&D themed. It’s the first one that I’ve been really excited about since Inotaizu. The theme (one I’m really interested in), ecological succession, is uncommon as is the mechanism for growth. The board is comprised of hexes in sections. The number of sections used depends on the number of players. 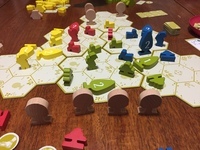 Standard cardboard hexes and tokens for movement (foot tokens) money and tools. The wooden components are wonderful only fitting for a game about trees. It contains large treeples in different shapes representing various species of trees. Each player has a worker, two tatara, 3 species of trees and a grand tatara in their color. There are also two species of neutral trees and succession tiles in the game. 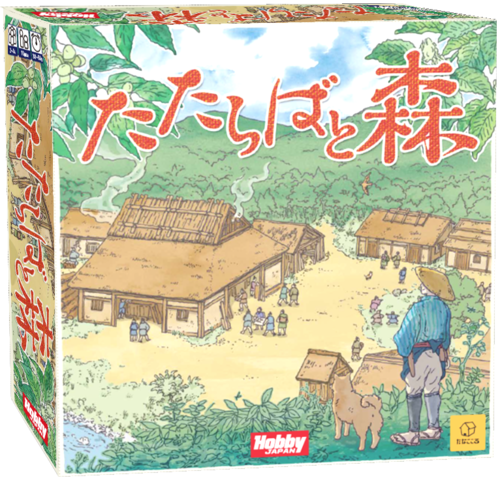 Each player controls a tatara – a bellows for making steel and a worker whose job is to harvest wood for income and tools and also for building as well as managing replanting the forest. The goal of the game is to build a grand tatara. Each player starts with one tatara and one worker. The board is seeded with neutral Kashi oaks. 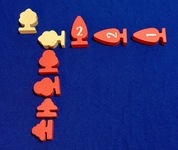 The number of players determines the size of the board and the number of succession tiles. Workers must move at least one hex and up to two hexes. Workers may move additional spaces by turning in foot tokens. Each foot token spent adds 1 movement. You may spend up to 4 per turn. Movement is limited by fully grown trees, opponents’ workers and opponents’ tatara. Hexes with grown trees count double for movement. You cannot end movement on the same tile you started on. You cannot end your turn on a tile with an opponent’s worker, tatara or full grown tree. You cannot pass through a tile with an opponent’s tatara. The worker may then do two actions. Planting – Players may plant one of their trees as a sapling for an action. Only two species are available to plant Red Pine and Cedar. Sawtooth Oaks (the third type of player tree) only reach the board through ecological forest succession. When a tree is planted it is laid flat to indicate it is a sapling. After the succession and growth phase if it is a Red Pine it stands up. Cedars are initially planted with the 1 side up, then flip to the 2 side in a subsequent succession and growth phase before standing. Harvest – Most fully grown trees may be harvested if adjacent to a worker yielding money or tools. Neutral “Buna” Japanese Beech trees may not be harvested. Players may harvest neutral Kashi Oak trees for 1 money or 1 tool.Harvested Kashi oaks are removed from the game. Red Pine yield 2 money. Sawtooth Oaks give 1 money and Cedars give one money or 3 tools. Players may harvest opponent’s trees by paying them 1 money. When Pine, Sawtooth Oak and Cedar are harvested, they may be immediately replanted in the space they were harvested from. There are 2 special actions a player may do which do not count as part of the above 2 actions. Once per game a player may build a second tatara for 2 money and 2 tools. It may be placed on any empty hex. It grants the player a third action per turn. Additionally once per game a player may build a grand tatara for 10 money and 10 tools. It may be placed on any empty hex and signals the game end (players complete the round). Succession tiles equal to the number of players are flipped face up. 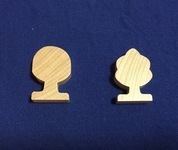 At the end of the round new tiles are flipped face up and these indicate that the board sections which match the succession tiles then have a growth period. All saplings except cedar become fully grown. Cedar saplings flip from side 1 to side 2. If they are already on side 2 then they become full grown. Full grown Pine trees that were not harvested become Sawtooth Oak saplings which represents ecological forest succession due to the growth of trees restricting their own kind and allowing other species to take their place. Full grown Sawtooth Oaks and Cedars that grow become Buna saplings-neutral trees which cannot be harvested and do not grow or have succession after they are mature. Kashi Oaks the other neutral tree also do not grow or have succession past standing. Once a player has built a grand tatara the game ends that round. Other players may also build grand tatara if able. Ties are broken by most money, then materials. The game also ends if a Buna tree is needed to place on the board and none are left in the reserve. I love the treeples, they are nice and chunky. The game is fairly simple to understand and play but there is a still a lot to consider. It interesting trying to anticipate growth and no growth is important. Trying to figure out what to plant and where to plant takes some thought but won’t drag the game down. It plays quickly. Being blocked by trees or an opponents’ tatara can also happen so planning for movement is necessary. What I really like about the game is the theme of managing natural renewable resources and I love the growth and succession mechanism. It really helps capture the theme. I certainly hope this game will see wider distribution. 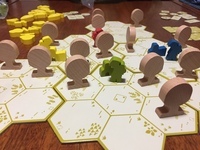 Joe Huber (1 play): I’m not particularly big on games which feel abstract to me, which Tataraba does; it all works, and as Lorna says the mechanisms support the theme well. But in spite of that the theme didn’t shine through enough for the game to really make the game for me, though I did enjoy getting the chance to try it.